If I define every thing as a whole made of its parts, these parts should be things as well – but made of what? If every part is composed by smaller ones, we fall in a regress that leads to infinitesimal elements. If we stop at an indivisible unit, it cannot be composed by parts nor multiples of itself: we can define it only through relations in a different reference system. 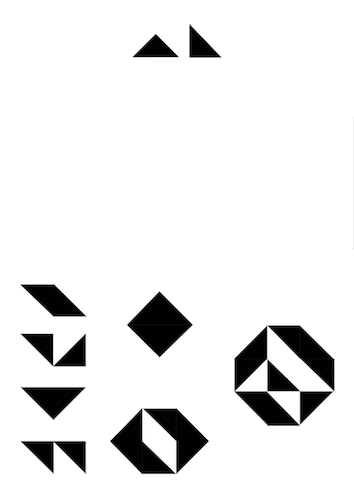 i.e: Suppose that the "minimum unit" that composes the forms in the lower part of the image is the upper triangle (let's call it the "elementary triangle"). Unlike these composite forms, you cannot describe the triangle in terms of triangles - it already is - but only on the basis of relations outside the system of the figures-made-by-elementary-triangles. To define an elementary triangle, for example, you can use colors, lines, ink particles, its symbolic value, mathematical formulas and so on. Colour, lines and ink, in fact, are not composed by elementary triangles. The minimum unit of any closed system can only be defined through reference systems where it's not the minimum unit. You might care to consider the following argument, set out in philosophical rather than scientific terms. The logic of your argument appears to be that there are or might be or must be infinite physical divisibility. Donald Baxter reconstructs and re-models an argument from Hume against infinite physical divisibility. What follows is a proof that there are indivisible parts. I will give four principles and then a reductio ad absurdum proof. After the proof I will discuss the principles. Please note that this is not a proof Hume actually gives; it is one he could have given using principles he explicitly and implicitly employs. That said, I should note that this proof relies heavily on the argument attributed to Mons. Malezieu at T.30. (1) Anything divisible is composed of parts. (2) Anything composed of parts is a number of parts. (3) A number of things does not exist; in other words, of the things that exist none of them is a number of things. Hypothesis: There are no indivisible parts. Here is a contradiction, so the hypothesis is false. So, there is some indivisible part. David Hume, A Treatise of Human Nature, ed. by L.A. Selby-Bigge and P.H. Nidditch (Oxford: Clarendon Press, 1978). 'T' in text. Donald L. M. Baxter, 'Hume on Infinite Divisibility', History of Philosophy Quarterly, Vol. 5, No. 2 (Apr., 1988), pp. 133-140. Not the answer you're looking for? Browse other questions tagged philosophy-of-science metaphysics ontology atomism or ask your own question.